The process of rearing organic beef requires great attention to detail as well as a lot of time to perfect. It is not simply the case that you can purchase some cattle and allow them to graze on designated land until they are ready for slaughter. The cattle must be fed on grasses and supplementary feeds in line with European Union legislation and during the winter months they must be properly housed in barns or so-called shippons (stone buildings normally found in the Scottish Highlands). During the winter months they are fed on organic silage and hays which give them the required nutrients and also help to give their meat the taste that is instantly recognisable as being very different from beef reared in more intensive farming conditions. In direct contrast with the nature in which organic beef is raised, intensive cattle farming is – just like poultry counterparts – a much faster process. The animals are kept in sheds, penned and fed with feeds which are genetically modified to encourage faster growth. 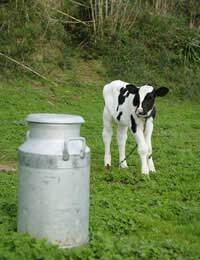 And in the case of cattle which are used to produce milk, a larger milk yield. Changes in farming through the decades have also allowed for intensive cattle farmers to reduce the risk of birth defects and also increase the number of cattle sired by a prize bull. Whereas in the organic beef farming sector this process is – although in some way guided by these scientific advances – much more relaxed and dependant on nature taking its course. By far the most important element of cattle farming – be it intensive or by organic means – is the amount at which the subsequent meat can be sold on to the retailer. Just as with poultry the beef produced by means of intensive farming can be sold to the retailer at a greatly reduced price whilst the beef produced by means of organic farming can be sold at a higher price with the emphasis on taste and a greater reduction in the number of GM-based feeds that are used. It is – of course – only natural that a means of farming which is more in line with how nature functions would cost more but this in turn makes the sale of organic beef a slightly less tempting proposition especially in households where food budgets are determined by average income. Disease is also a factor to take into consideration when producing beef whether organically or intensively. There have been many instances over the last few years of foot and mouth disease breaking out in the United Kingdom and these have been attributed to animals which have been allowed to graze outdoors whereas the risk to animals which are kept indoors for the duration of their lives is much less.